In a small bowl, mix lemon juice, Worcestershire sauce, mustard, oil and garlic. Place pork in a shallow glass dish, pour mustard sauce over the top. Cover and refrigerate 4 to 24 hours turning every few hours. 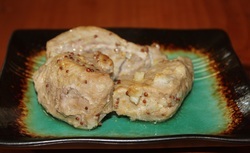 Bake pork un covered with the sauce for 25-30 minutes or until no longer pink.